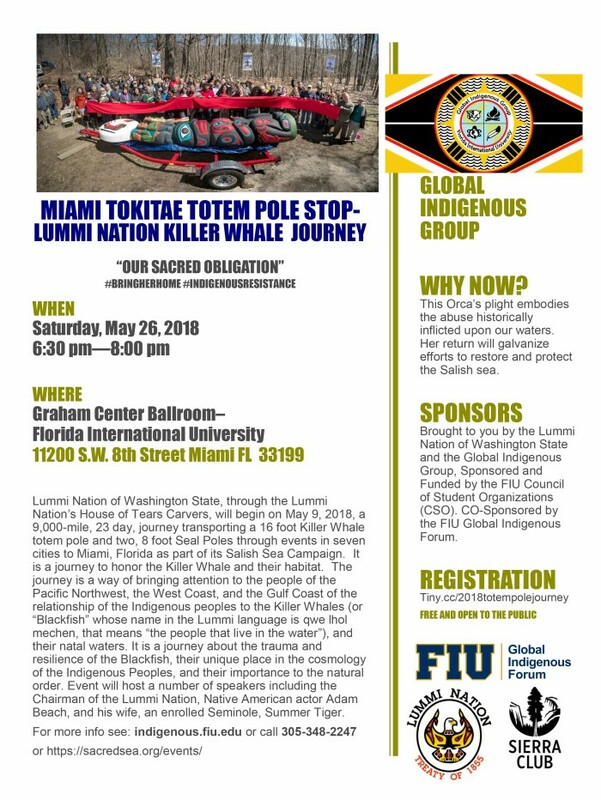 Lummi Nation of Washington State, through the Lummi Nation’s House of Tears Carvers, will begin on May 9, 2018, a 9,000-mile, 23-day, journey transporting a 16-foot Killer Whale totem pole and two, 8 foot Seal Poles through events in seven cities to Miami, Florida as part of its Salish Sea Campaign. It is a journey to honor the Killer Whale and their habitat. The journey is a way of bringing attention to the people of the Pacific Northwest, the West Coast and the Gulf Coast of the relationship of the Indigenous peoples to the Killer Whales (or “Blackfish” whose name in the Lummi language is qwe lhol mechen, that means “the people that live in the water”), and their natal waters. It is a journey about the trauma and resilience of the Blackfish, their unique place in the cosmology of the Indigenous Peoples and their importance to the natural order. The event will host a number of speakers including the Chairman of the Lummi Nation Jeremiah Julius, actor/activist Adam Beach, and his wife, an enrolled Seminole, Summer Tiger. Brought to you by the Lummi Nation of Washington State. Organized by the student club, the Global Indigenous Group. Sponsored and funded by the * FIU Council of Student Organizations (CSO)*. CO-Sponsored by the FIU Global Indigenous Forum. For more info see: indigenous.fiu.edu or call 305-348-2247.